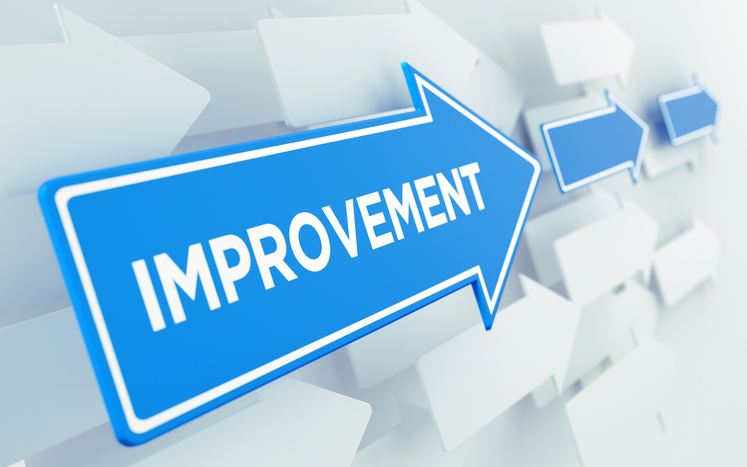 Expert insight into how you can take steps to best improve your GMP auditing program. Recently, ProPharma Group conducted a poll to quality professionals across the country to understand the challenges that FDA regulated companies face in managing their GMP auditing programs. As depicted in the following graph, respondents felt that the areas that they could most improve upon were on the front-end (scheduling based on risk) and the back-end (follow-up and CAPA monitoring) of the audit process. The leading two responses indicate that companies are likely challenged with resource limitations (e.g. personnel) and time constraints. Scheduling audits on the front-end and following up on audit responses on the back-end requires resources and is typically required to be performed within a set time frame. 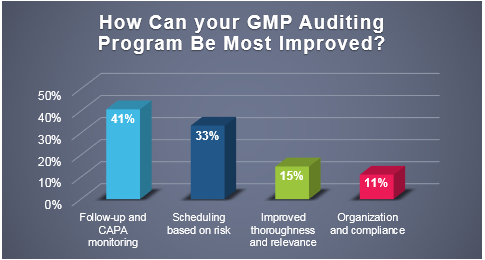 Per the poll responses, 41% of respondents stated that following-up after audits are performed and monitoring CAPA commitments was the area that could be most improved in their GMP auditing program. This response brings up the question how important is it that companies follow-up on audits and monitor CAPA commitments made by their suppliers? In my opinion, the answer is very important. Think about FDA’s expectation that firms respond to 483 observations with a plan of action for each observation, along with timelines, metrics, and supporting documentation / evidence of resolution. Since the 483 observations do not “represent a final agency determination regarding compliance”, the response is also a chance to object to the observation or provide the agency with progress or intention to remediate before the final agency determination of compliance. In other words, the observation response and supporting corrective / preventive action plan is an opportunity to demonstrate to the agency that your firm takes compliance and quality issues seriously and that the firm is committed to assigning resources to resolve. In the same way, companies should review their supplier’s responses to audit observations and determine if the stated remediation is appropriate and sufficient enough to address the concerns. After all, suppliers are an extension of a company’s operation and any quality or compliance issue with the supplier could become the company’s issue. Also, the response to audit observations allows the company to determine how seriously their supplier’s take compliance and quality, and their level of commitment to their customers. As for monitoring the supplier’s CAPA commitments, remember the phrase “Trust but Verify”. Of course, we want to give the supplier the benefit of the doubt when they are remediating observations; however, it makes good business sense to verify that the commitments are being met. Therefore, it is recommended that companies perform routine follow-up with their suppliers to determine progress in completing CAPA commitments. As mentioned in a previous ProPharma Group blog (Industry Poll: What are the Leading Challenges with GMP Auditing? ), the front-end process of developing an audit program was the greatest challenge to responding firms. It was discussed in that blog that time constraints, competing priorities, and supplier availability to host an audit were contributing factors to this being the leading challenge. Furthermore, the blog provided a risk-based solution for developing a vendor qualification program to reduce those challenges. Similarly, for this poll, 33% of respondents felt that implementing a risk-based approach to scheduling audits could provide the greatest improvement to the GMP auditing program. 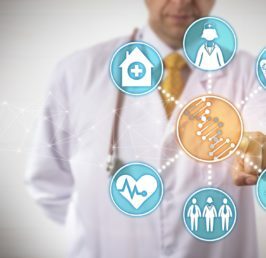 By developing a risk-based vendor qualification program, GMP audits are performed and scheduled based on risk and will help alleviate some of the pressures that quality groups face. To achieve a risk-based auditing program, all outsourced materials and services need be evaluated to determine the level of risk that failures could have on the quality, safety, and efficacy of the final product and the reliability of the supply chain. Also important to note, is that not all suppliers require a GMP compliance audit. On-site audits should always be performed for suppliers of higher-risk and critical materials / services, while low-risk, non-critical materials would have less stringent supplier criteria (e.g., historical performance, questionnaire, certification, etc.). It is certainly understandable that companies are challenged to do more with less resources in a shorter amount of time, which is reflected in this poll result. However, because the qualification and management of suppliers is such a critical component of ensuring the quality of manufactured products, companies cannot afford to cut corners on following up on supplier CAPA commitments. Because your suppliers’ problems are your problems, it is in your companies’ best interest to verify that observations are properly addressed in a timely manner. If your company is resource limited to follow-up on supplier audits and CAPA progress, ProPharma Group can help. From front-end to back-end, our auditors collaborate with companies and their audited suppliers to recommend risk-based CAPA to address observations and to track / manage commitments. Successful and timely resolution of issues benefits all involved parties. Also, by implementing a risk-based supplier qualification program, your firm can be assured of control over outsourced materials and services while reducing the internal resources required to perform on-site GMP audits. Risk-based auditing programs allow you to increase the efficiency and utilization of your staff and enhance your GMP auditing obligations.